Stephen Turner discusses the merits of the ISO/TC 205 and the implications of their techniques. Stephen Turner and Christopher Armstrong provide a comprehensive day-long training seminar on Rhode Island's use of the Internatinal Green Construction Code. Stephen Turner discusses occupant comfort and indoor air quality for ASHRAE. 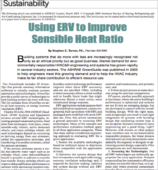 Stephen Turner provides insight into Energy Recovery Ventilation Methods in his article, Using ERV to Improve Sensible Heat Ratio, published in ASHRAE. 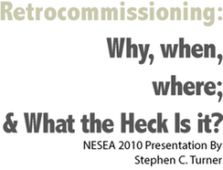 Stephen Turner presents the 4 W’s of Retrocommissioning to the NESEA design community. Our team is made up of active professionals with decades of experience in the field – as state code board members, chairs of various buildings standards committees, national educators on commissioning, publishers in peer-reviewed industry journals, and licensed journeymen and technicians.